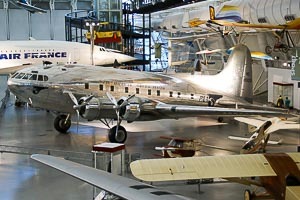 The Boeing 307 Stratoliner is a four-engine long-range Airliner with a capacity of maximum 33 passengers produced by the US-American manufacturer Boeing Company. The Boeing 307 Stratoliner was the world's first fully pressurized airliner. It was developed together with Boeing Model 299, the later B-17 Flying Fortress, sharing a lot of components including the wings. Of the only 10 produced Stratoliner three aircraft were operated by Pan Am, five by TWA and one as a private VIP-aircraft by Howard Hughes. The sole prototype was destroyed during a test flight.